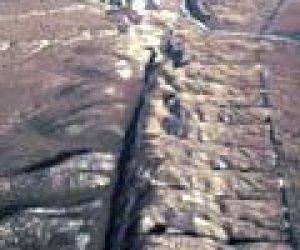 In January of the year 1857, a large earthquake shook the San Andreas Fault in southern California. Geologists want to know how strong the quake was, so they can better predict how strong future quakes might be. But no scientific instruments existed back then to measure the quake. Dawn Martindale is an historian at Utah State University in Logan. She’s helping geologists find eyewitness accounts of how earthquakes felt — in old diaries, journals, newspapers and photographs. Dawn Martindale: We use what’s called the Mercalli index, and its based on how a person feels or what happens to the buildings or the ground, and we assign an intensity, and it’s on a scale of 1 to 12, and from there I can kind of gauge where the epicenter was at. Martindale makes maps that pinpoint where the quake occured. Geologists compare her maps with fault maps and identify the active fault and estimate the strength. Dawn Martindale: I’ve always been interested in history since I was a little girl. And I’ve also been interested in science . . . But I never thought you could combine them . . . I had no idea I could even do this for work. So I was really excited. The letter goes on to describe the earthquake direction, as well as the 40 mile long fissure which opened during the quake. After writing this letter, TenBroeck began to keep records of all the aftershocks. He noted the time, and whether they were strong or weak earthquakes. He was helped out by the hospital staff — if one occurred during the night, the staff would tell him about it in the morning. After six months, he took his ledger and analyzed the results. Here’s an excerpt from his analysis letter. One of Martindale’s tasks is to check out the people who write these documents and make sure that they are trustworthy sources of information. She says that Captain Peter TenBroeck seems reputable, and was known for being scientifically minded. Martindale plans to look for more of TenBroeck’s letters in the National Archives in the future. It’s known that large earthquakes can trigger other earthquakes far away in other parts of the world. So now, Martindale and her colleagues are going to look at records from quakes in Nevada and southern Utah in 1857 to see if they were triggered by this big California quake — Fort Tejon. This could give scientists clues about what might happen in future earthquakes. Finding information about historical earthquakes is a treasure hunt, and many hours are spent poring over old documents, letters, and diaries. Dawn Martindale begins many of her searches with state historical societies. These organizations have libraries — most people don’t know they exist — where the historical societies take care of diaries, journals, photographs, and maps and other artifacts of life in the state. When she goes to these libraries, Martindale gathers any artifact that was written during a certain time period, and then reads it, looking for any information. The information could be tiny — a reference to a building that fell down, or a new crack that appeared and crossed a road. But the clues can also be dramatic. During the Fort Tejon earthquake, someone described how half a circular corral was shifted so much that the corral became an S-shape. Others described how the river sloshed back and forth so much it fell out of its riverbanks. Martindale also hunts for newspaper articles. Unlike geologists, who might only look in the biggest, well-known newspapers for information, Martindale hunts for newspapers from smaller communities. When she finds them, she reads them for at least a week after the event, sometimes up to 45 days if the earthquake were very large, as was the case in Fort Tejon. Maps, and photographs and old sketches are also important, since they describe what type of houses and buildings the people used, and how these structures were affected in the earthquakes.